I am currently WWOOFing with a woman named Sue Arthur who owns Over The Moon Dairy in Putaruru, New Zealand and her partner Neil Willman. Sue is a professional cheese maker with award winning cheeses and Neil is a cheese making teacher and judge from Australia. He has also written a book called The Guide To Making Your Own Cheese. I have been interested in learning how to make cheese and now am getting to learn what an art it really is! Last night we made Halloumi cheese. Halloumi is popular in Greece. It is a cooked cheese and one of the few cheeses you can eat the same day you start it. It doesn't require a starter culture and is very easy to make at home! BeforeI get started I want to point out the two things Sue said to remember that are THE two most important things in cheese making. Note: Rennet comes from the fourth stomach of new born calves. The calves do have to be killed to supply the rennet, so if you are a vegetarian you can use vegetarian rennet which is what we used to make our Halloumi. Ours was a microbial rennet that comes from a fungus and is called Chymosin. So that being said, let's get started! The first thing you need to do is heat your milk to between 109.5°F and 113°F. (These are converted from Celsius) We did this by just putting the milk in the microwave. Because there is no starter added, 109.5°F or 43°C is the temperature that the rennet works the fastest. So once you've warmed your milk, pour it into one of your containers. Make sure it's one without holes in the bottom! Use your thermometer to find out what the temperature is. Make sure it is no cooler than 109.5 and no warmer than 113. Next you will need to add the Rennet. We used 2mL of Chymosin rennet. Use your dropper to measure out how much you need. Make sure as you add it you are stirring your milk. Also, don't add it all into the same place, drop it all around while you stir. Once it is all in, continue to stir for about 15 seconds, then let it sit for about two minutes. While that is sitting go ahead and get your cloth out and lay it inside of the container with holes in the bottom. It should be the same length as the container and cover the bottom. Cut it so that it just hangs out over the top a little. Once it is like the picture below, just place that container into another container, one without holes. Once that is done, you will need to test your curd see if it is ready. To do this take your knife and cut it just a little a couple inches out from the edge. Then take your knife and turn it on it's side, sliding it in at the edge of the container, lifting up to see the consistency of the curd. It wasn't ready on our first cut, this time it is! That's pretty much how it should look when it's ready. Next you are going to want to take your knife and put it straight down in to the curd. You will slice it back and forth through the curd both long ways and short ways to cut all of it it into corn sized pieces. Then take your whisk and gently spin it back and forth to make sure everything is cut into small enough pieces. Note: The longer you stir your curd and the smaller the pieces get, the firmer the cheese will be, the shorter, the softer. So now you have your curds and whey! Curd being the chunky bit and whey being the liquid. Next you will need to strain your whey out using your strainer. You will need to make sure to get as much of it out as possible. Also, make sure to strain it over your sauce pan, you will need it for later. Once you've got the whey strained out, take the saucepan and put it on the stove and get it heated up to about 203°F, just below boiling. Now take your strained curd and dump it into the container with the cheese cloth. Level the cheese out then take the extra cheese cloth and fold it over on top of the curd. Fill up your third container with water and set it inside of the one with the curd so that it acts as weight to press any remaining whey out. Leave it there for about 30 minutes, if you want the cheese to be a little more firm you can leave it for an hour. You can see how the remaining whey is going through the holes in the bottom and being collected in the bottom container. The cheese cloth just prevents the holes from getting clogged with the curd. You want the final thickness of the curd to be about 1 inch. When it is ready, take off the container of water and press the top of the cheese cloth to feel the consistency of the cheese. It should feel a bit like rubber. Next, tip the slab of curd out on to a cutting board or plate. We just dumped ours onto the lid of one of the containers. Now cut it into big sections. Next, place them into the almost boiling whey. Put the whey on medium heat so it doesn't get any warmer, you don't want it to boil. You will notice the curd pieces will sink. Eventually after a couple minutes they should rise to the top. If you feel like it's been a while and they haven't risen, try moving them around a bit and make sure they haven't gotten stuck to the bottom. Here, you see they have risen to the top. Next you need to put the pieces directly into your brine. Be aware that because there are no starters in Halloumi, there is no acidity which is what preserves cheese. So you need to make sure to be very hygienic once you've removed the pieces from the hot whey or harmful bacteria could get on your cheese. If you don't plan to eat them immediately, put it directly into the fridge after it's gone in the brine. You should let them sit in the brine for 1-3 minutes depending on how big your block is and how salty you want it. We left ours in for about 2 minutes. Once you take it out, either let them air dry for a minute or pat them dry. Lastly, just slice each bigger piece in to smaller pieces and cook them on the pan until each side is nice and brown! If you have a good non stick pan you won't need any oil. And now you've made Halloumi cheese! Enjoy! Also, just so you know. While different cheeses have different starter cultures, recipes, aging periods etc, once you learn how to make one kind of cheese, it is somewhat of a similar process to making others. It's kind of like learning to bake a cake, once you have the basic gist of the steps, you alter the recipe and baking times and you come out with a different cake. So while cheese making is most definitely an art of it's own and takes a lot of practice as well as trial and error, after making Halloumi, you now have a basic understanding of how to make cheese. I encourage you to look up some other recipes and try some different kinds! Here is a picture from Neil's book of the recipe we used and some more pictures. If you are curious to know why Halloumi cheese doesn't melt, there is a scientific explanation. Starter cultures produce lactic acid, which subsequently dissolves calcium, which is then removed from the protein or casein. So depending on how much of the calcium is removed determines whether your cheese will be soft and crumbly or tough and rubbery as well as all the textures in between. In milk 2/3 of the calcium is bonded to the casein protein and when none of the calcium is removed during cheese making the cheese will be very tough and rubbery like halloumi. With cheeses with starter cultures the acidity produced by the starter cultures dissolve some of this calcium from the casein enabling the protein structure to be weaker and become more elastic like stretchy mozzarella, or total removal of calcium from the protein causes the structure of the cheese to be crumbly or chalky like feta. So the message is that because you haven’t removed any calcium from the protein in halloumi it’s rubbery and squeaky in the mouth and doesn’t melt. I am currently at Marahangia, a permaculture farm in Otoko, New Zealand outside of Gisborne on the east coast of the north island. I have gotten the opportunity to plant a few trees and I thought I would blog about the process since it's relatively easy and a great way for anyone to be able to make a positive difference on our planet. So the trees we are planting here have been growing in pots, Adam, our host, buys them grafted from a local company. Depending on what kind of tree you have depends on what time of the year you should plant it. Deciduous trees should be planted in winter time when their roots lay dormant. An evergreen tree, which is what we are planting today, should be planted in late spring when it is warmer and the roots won't freeze in the dirt, but before the heat of the summer when it's too hot. However, our tree was ready to be transplanted so we went ahead and did it even though it is late summer. It isn't ideal to do this, but if you need to just make sure to use A LOT of water and plant later in the day when it is cooler outside. So the first thing you need to do is soak your tree. It's going to need lots of water to survive! We just soaked ours in a big trash bin and that worked really well. Next thing to do is pick out a space where you want the tree to go! You are going to be digging a square hole that is about three spades wide and one deep so make sure you will have enough room to dig. If the area needs to be weeded then do so so that it will make your digging easier. The easiest way to weed your area is to lay your spade flat on the ground and shave the weeds with the end of it. Future home of a fig tree! If you don't want to lose any dirt while digging then lay out a tarp that you can shovel your dirt on to. It also makes it easier to get all your dirt back into your hole at the end by just lifting one end of the tarp and letting gravity do the work! You want to make sure that the walls on in your hole are vertical and not slanted, also try and make your corners as sharp as possible rather than being round. I will explain in a moment why this is important. Also, so you know, you are digging a square hole because it provides good drainage so water doesn't collect around the roots. Once your hole is about a spade deep the next thing you will need to do is fork the soil so that its nice and loose. 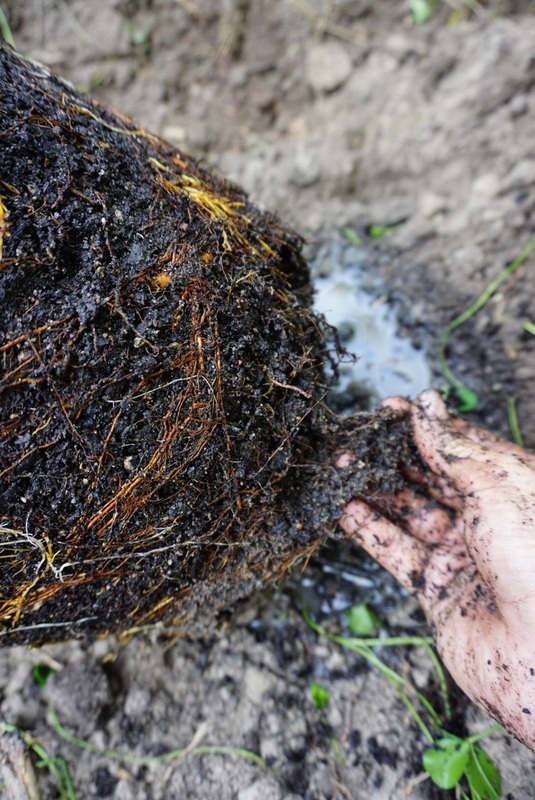 You want the roots of your tree to have an easy time making their way through the soil so your tree can grow! You will know your soul is forked enough when you can stick the fork all the way into the earth without much effort. You'll notice the lighter color soil means I made it to the subsoil. Once all your soil is forked the next thing you want to do is take your spade and cut all four corners of your square as well as a few slots on each side. This breaks up the dirt more so that the roots can more easily make their way out of the hole. This is why it's good to have vertical sides and sharp edges, to make the cuts easier. 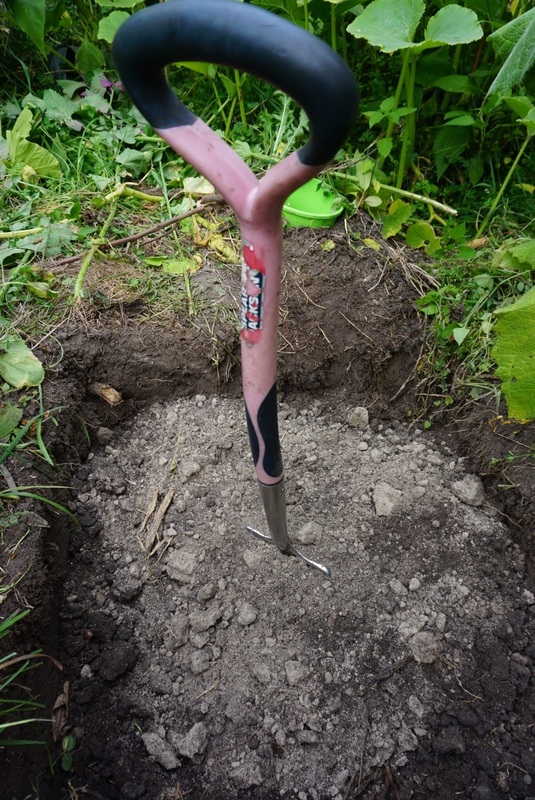 It is easier to have the spade half way in the hole and half way in the soil. Just push it all the way down and wiggle it a little so there is a nice cut in the earth. Then it's time to get your tree out of where it's been soaking and put it in your hole! Make sure it's sitting firmly in the hole and that the top of the hole is an inch or so beneath where the tree's base meets the soil it's already in. You want the trunk of the tree to be slightly above the original ground so when you add water the trunk won't be sitting in it and rot. 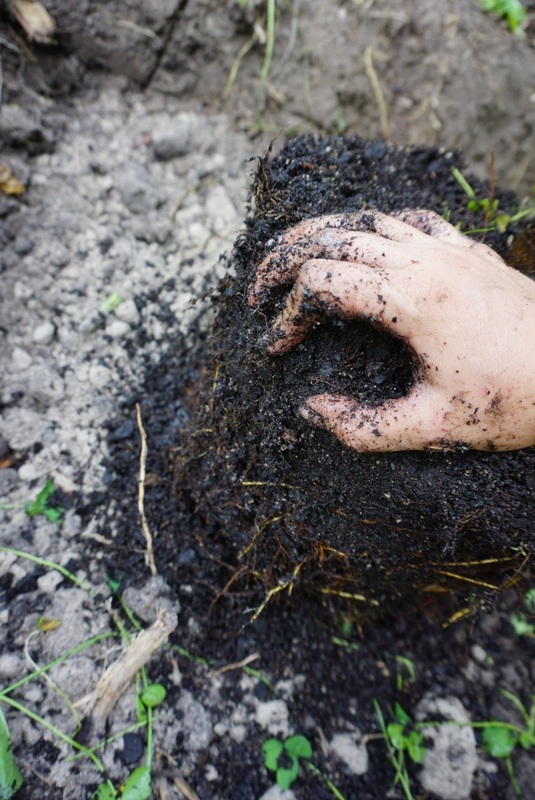 Massage the dirt a little to get the roots loosened up. Then, fill the hole about half way back up with dirt. Next, fill the hole with about 3 or 4 buckets of water! You do this because you want the soil to settle, you will notice tiny little holes in the dirt once the water goes down. The water helps take away any air pockets. This is important because if the roots of your tree hit an air pocket they will stop growing. So fill fill fill! Once you've put multiple buckets in and the water is totally drained, add the rest of your dirt! You can make a kind of shallow bowl shape with the soil because you are going to need to add more buckets of water! The bowl shape helps keep the water in the area where you want it to be, but make sure it is shallow so the trunk doesn't sit in water. Then once again, add 3 or 4 more buckets! You will let this sit overnight. When you come back the next day, add your mulch around the tree to help prevent weeds. We also added comfrey plants around the base because they add a lot of nutrients to the soil. Here's a picture of an orange tree I planted a few days ago that is all finished. Make sure once your mulch is on and if you want to add some comfrey plants that you again add a few more buckets of water. You want your tree to be totally hydrated to have the best possible chance of becoming a strong, healthy adult. You can also add a plastic tube or tree protector around the base of the tree so that it is protected from animals. Now one day, Adam will have some very tasty figs! I hope you enjoyed this blog and that you take initiative to go plant a tree of your own! Have a beautiful day! While here WWOOFing at Wildside Backpackers Lodge in Hari Hari, New Zealand we made some jam. I thought I would make a blog about it since it was easy, and so much fun! Also I have a feeling while many people eat jam, very few probably know how to make it themselves. So, here it goes. First of all you can make jam with pretty much any fruit or berry. The difference between jam and jelly is that with jam you don't strain out any of the seeds, skin or chunky bits and with jelly you do. (Also if you are curious about what marmalade is, it's pretty much the same just with citrus) So jam is chunky and jelly is smooth. So the first step in making jam is to pick out what kind of fruit or berry you want to use. We did two separate batches, one with Gooseberries and one with Blackcurrants. a chart with the amounts of pectin and acids in fruits. If you are making jam with something low in pectin you can add an unripe grated apple skin to add more pectin to your batch. Fortunately for us, both Gooseberries and Blackcurrants are high in Pectin so we didn't have to add anything, however both are a tart berry so we had to add a good amount of sugar. So once you've picked out what berry you want to use you have to get all of the stems off of them. (If you are making jelly you don't have to worry about this because you will strain it out in the end) We found with the blackcurrants it would be better to make jelly with them because of how time consuming de-stemming every single little berry was. Next you need to put it into a big pot and mash them! You need to make sure that every berry has busted, it's fine if they aren't totally smushed because once they start boiling they will separate but they at least have to all be broken open. Then add your water and sugar. We used about 2 kilograms of sugar and 1 cup of water, again the picture below will show you a chart of amounts you can use for different berries. Once you've added everything into your pot you should boil it on high for at least 10 minutes, stirring frequently. Once the jam starts to thicken, you can turn down the heat. You will probably get some white frothy stuff on top, just spoon that off. After about 30 minutes and it starts to get really thick you will need to stir it constantly so it doesn't stick to the pot. Be warned, it will get a little messy! If you think it's starting to look like it's the right consistency you can test it by dropping some onto a plate. Wait for it to cool down and then move the plate around and see if it runs. If it holds its place, it's ready! Lastly, once it's ready, jar it immediately! Note: If you have a big batch like ours and you are going to be storing the extra jars for a while, you need to sterilize your jars by washing them with hot water and putting them in the oven for about 10 minutes on about 275 degrees. Then fill them up all the way to the top and screw the lid on as tight as you can so that the top pops up and seals after an hour or so. And there you have it, you've made your own jam!